The flight from Houston to Gunnison was surprisingly good, considering that heavy rain and strong winds had kept us awake half the night. The girls were very excited when we started to fly over mountains and saw snow. 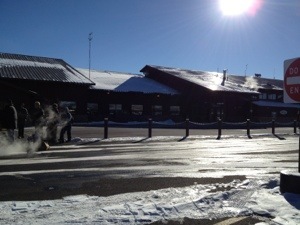 When we landed in Gunnison they could see snow everywhere, much more than when we were last this way in March. The small airport made the girls laugh. Having only ever been in large international airports, they couldn’t believe that this wooden building was a real airport. My Lovely Husband was very pleased – the hire car pick up took 2 minutes and the hire car itself was less than 30 seconds walk from the building! It was very cold but before we could head to the house we needed to do some food shopping and find a Christmas tree. This accomplished, we drove the 20 minutes to Crested Butte. As we climbed higher into the mountains we moved into perfect Christmas card picture territory. The snow had fallen heavily in the last week so everything looked pristine and beautiful. The temperature dropped as we arrived at the house, but fortunately the house was cosy. We unpacked the shopping whilst my Lovely Husband wrestled with the Christmas tree, then gave up as he couldn’t get the tree to fit in the stand. Some problems are the same the world over! Instead we got dressed in warm clothes and had a play in the snow. It looked beautiful but it was too cold to form snowballs or a snowman which the girls found very disappointing. We headed out for dinner and were surprised at how much the temperature had dropped since the sun had set. It was colder than we’d ever been (although I think my Lovely Husbands time in Kazakhstan was just as cold). The girls hated it! But that’s not surprising as the temperature had dropped to -22c and this was at 9pm so I guess it got a lot colder in the night. It had been 28c in Houston the day before so it was a bit of a shock for all of us!